This is a super short novella that is a part of a series but can be read as a standalone. I liked it but didn’t love it – it was just too short to become super invested and I didn’t have a chance to connect with the characters like I would have liked. Rachel Kline is a school teacher who had a one-night stand with her rescuer, Logan, a member of Alpha Security. Rachel was kidnapped and fed drugs – now almost 2 years later, Logan is bailing Rachel out of jail after she’s been swept up in a local brothel raid while searching for her lost friend. Logan just wants Rachel out of harm’s way but she’s having none of that and insists on helping to locate her lost friend. I liked that though this is a short read it’s filled with a page-turning amount of drama, action, and romance. I was pulled in enough that I’d definitely like to go back and check out the other books in the series. Rachel is a school teacher that somehow gets kidnapped and addicted to a cocktail of drugs against her will. When she is "better," her friend, Carly needs her help and she doesn't hesitate to jump in head first. Then you have the alpha bodyguard who will stop at nothing to show Rachel that he can be what she needs – that he wants her despite all of her past. Logan is definitely the alpha in this story and while he was pushy and somewhat annoying at times, you truly understood that he wanted to keep Rachel safe. Of the other stories in this series, this is the one that I have liked the least, so far. It was a fast-paced story, but the chemistry between the main characters was just not quite right for me. Also, the strangeness of the story – who was involved and what they were trying to accomplish – felt a little muddy. 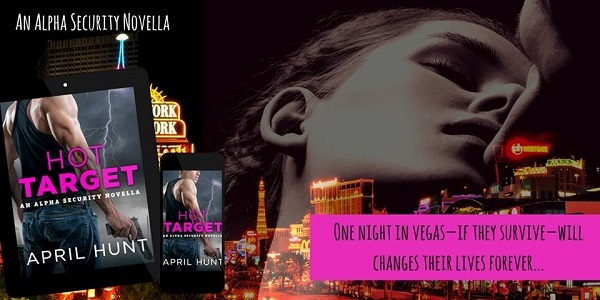 Reviewers on the Wicked Reads Review Team were provided a free copy of Hot Target (Alpha Security #3.5) by April Hunt to read and review.